Looking for a special dining experience? Head off to Matgalne. Situated at the corner of Makati Avenue and Kalayaan Avenue, Matgalne is a Korean buffet restaurant that offers unlimited samgyupsal (pork belly), unlimited chadolbaegi (beef) plus over 20 side dishes to complement your grilled food for only 399 pesos per head. Don’t be fooled by its simple interiors, the authentic Korean food it serves is beyond simplicity. Matgalnestaff are friendly, prompt, and attentive to the customers’ needs. Its owner, Mrs. Wendy Park, also serves a wide variety of authentic Korean dishes cooked to perfection using only fresh ingredients. While the pork and beef cutlets were cooking on the grill, I went for some Chap Chae noodles. Made from sweet potato flour, the noodles’ light sweet flavor is what gives it a distinct flavor. It is the best Chap Chae I’ve tasted! I prefer it over the traditional Chinese “pancit’ that we Filipinos got accustomed to. The freshly sliced mixed vegetables further makes the savory noodles delectable. Other than Kimchi and Chap Chae, the side dish selection includes fresh greens plus other food options dipped in a light egg batter and deep fried. 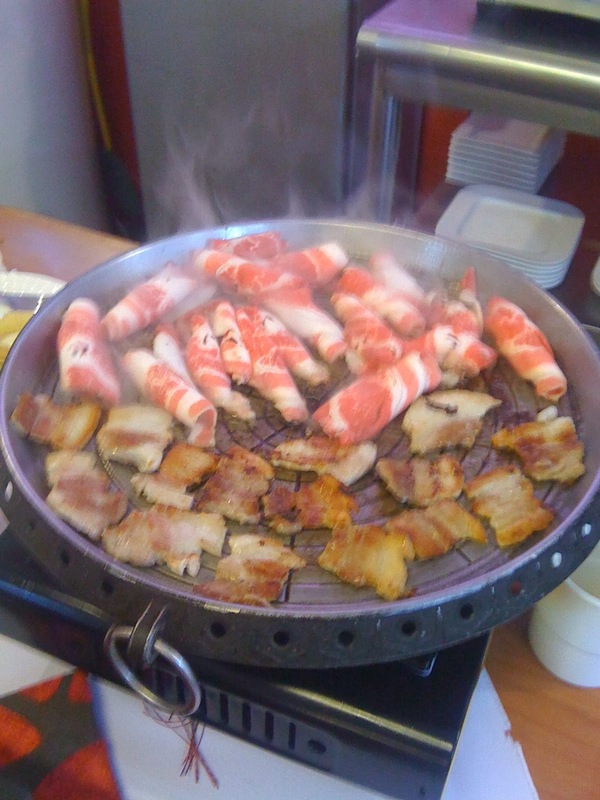 I had my fill of unlimited samgyupsal and chadolbaegi eaten in the Korean style. The grilled meat wrapped in lettuce leaves with kimchi and gireumjang (salt and black pepper in sesame oil). I prefer this condiment overssamjang (soybean-chili paste). I like Matgalne’s simple food style. I prefer using a mixture of salt, pepper, and sesame oil on the meat to enhance its natural flavour. The Mattang or caramelized sweet potato, similar to our “camote cue”, is something I love as well. I consider my Matgalne dining experience as satisfactory! Go indulge in this food adventure. You may avail of their 999-peso lunch promo for 3 heads between 11am and 4PM. Patrons may also avail of 10% discount on their bill onsite by uploading a picture of their Matgalne food adventure on facebook.